Stock photo of clock and architectural design of the main tower of the Neues Rathaus (New City Hall) in the Marienplatz in the City of Mnchen (Munich), Bavaria, Germany, Europe. Clock and architectural design of the main tower of Neues Rathaus (New City Hall) in Marienplatz. This stock photo shows the architectural design of the main tower of the Neues Rathaus (New City Hall) in the Marienplatz in the City of Mnchen (Munich), Bavaria, Germany, Europe. 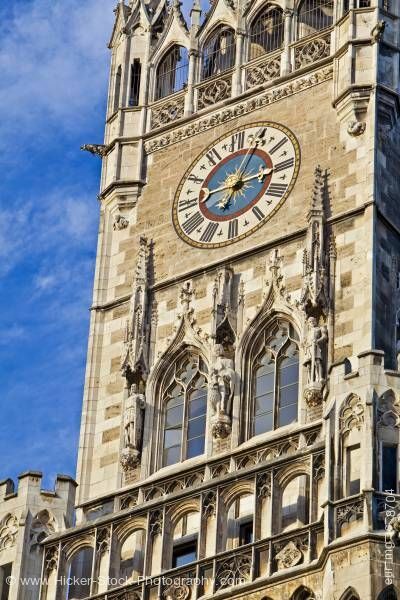 This close view shows the ornate details of the Gothic Revival architectural style of the Neues Rathaus’s clock tower. Roman numerals decorate the clock face of the tower. The center of the clock has a blue background with a gold sun in the center along and decorative clock arms. The clock tower’s features have the beautiful arches and ornate frames. Elaborate pinnacles and gargoyles are part of the Gothic Revival style of architecture. Three beautiful carved statues stand on either side of the windows. Clock and architectural design of the main tower of the Neues Rathaus (New City Hall) in the Marienplatz in the City of Mnchen (Munich), Bavaria, Germany, Europe.